illustrates the legend according to which the tool was found on the site of the first foundings. Its historical heritage is prestigious : the magnificent mosque Quaraouiyyîn (IXth – XIIth century) is the first university of the western world which was founded before the Sorbonne in Paris. Inside the surrounding walls pierced by gigantic doors, some of the nicest examples of the Muslim art of the Maghreb can be found (Madrasa Bu-Inaniyya, 1350 – 1357). 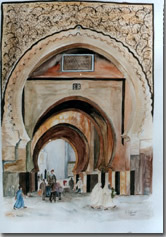 Fès also has a diversified and very ancient handicraft tradition. The first inhabitants of the city, whether Andalusian or Kairwanese, brought a know-how that remained undenied. 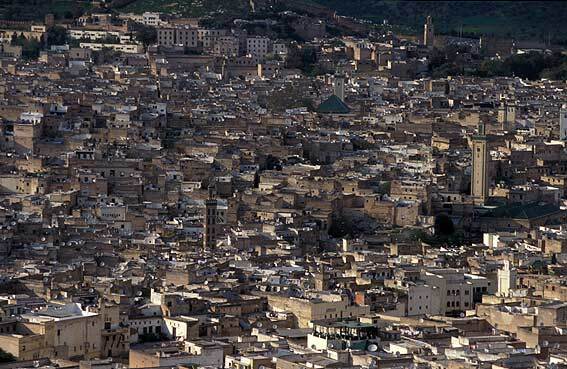 Nowadays, 30 000 craftsmen carry out their art in the medieval medina of Fès el-Bali. Potters and ceramists (zelliges) gave the city its reputation. The tanners’ neighborhood remains as a living testimony of an ancestral technique.